Visual art project: Buenos Aires, Santiago de Chile and Texas. 2009 – 2017. Part of the project was selected in The AMoA Biennial-600: 7th. Architecture exhibition of the Amarillo Museum of Art. “Gentle Terrorist” is a series of pen and ink drawings done mainly on found or recycled paper and architectural floor plans. 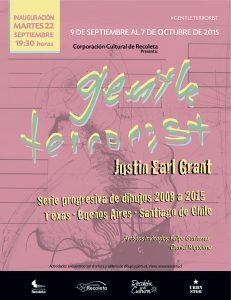 In November 2014, the “Gentle Terrorist” project was selected to be presented in the version “Se Alquila Estado” in Buenos Aires. The project would therefore be part of the annual selection of the Spanish collective Se Alquila. 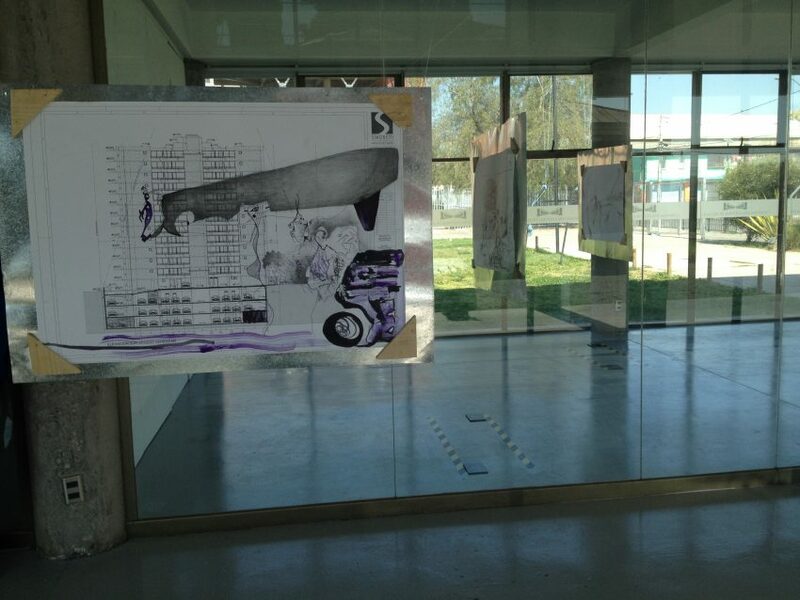 Subsequently, while living in Santiago, Chile, the artist was invited by the Corporación Cultural de Recoleta to exhibit an expanded version of Gentle Terrorist. 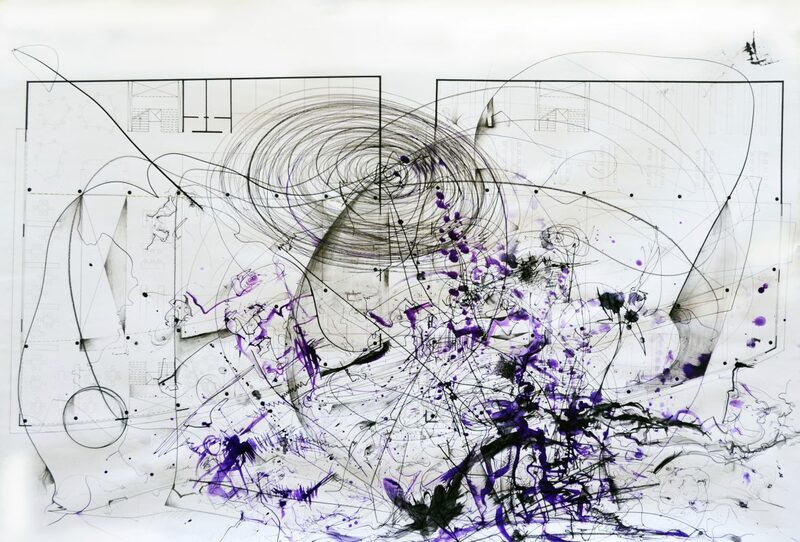 This series of works constitutes a personal exploration of the artist, and consists of drawings made during the course of 8 years while living in Texas, Buenos Aires, Argentina, and Santiago, Chile. The state and conditions of an existence violated by power and life expectancy are some of his reflections in this work. The mounting of the exhibition in Santiago, Chile contained several aspects of installation alluding to dormant elements of the work derived from the precarious construction of zinc plates, wood, and precaution signs. These served to add to the controversy about a violated life. “Creo que el dibujo es un arte visual que manifiesta las emociones inmediatas, espontáneas, y por lo tanto honestas, que se manifiestan en esta serie de dibujos en los cuales expongo mi sensación y sentimiento en el momento de su producción. La serie obtiene su nombre a comienzos del año 2008, en Texas, cuando mi hermano mayor se suicidó y dejó una nota de tareas encabezada con la frase «gentle terrorist». Sin embargo, este terrorista amable no está limitado a mi hermano. Luego de ocho años viviendo aquí en Sudamérica, he conocido personas directamente afectadas por el terrorismo de Estado. Desde entonces, confrontando ambas realidades, concibo que en países como Estados Unidos existe una forma articulada distinta, también desde el poder, para implementar terror pero sin asesinatos masivos ni desapariciones forzadas. Entiendo ahora, que estamos inmersos en vivencias cotidianas rodeadas de actos violentos pasivos, y es en esta construcción sistemática de violencia y amabilidad, sutil y arrasadora al mismo tiempo, donde sucumben mi hermano y muchos más como él. Con estas reflexiones y bajo la conmoción de la tristeza, ira, confusión y aborrecimiento, el dibujo me alivió. “I believe that drawing is a visual art that expresses the immediate, spontaneous, and therefore most honest emotions. In this series of drawings I expose feelings and sensations with an urge and frankness shown by thier uninhibited production. The series got its name in the beginning of the year 2008, when my older brother committed suicide and left behind a task list with the phrase “gentle terrorist” at the top of the page. However, this gentle terrorism is not limited to my brother. After eight years of living in South America, I have known people directly affected by terrorism of the state. Since then, confronting both realities, I believe that in counties like the United States there is an articulated and different way, but also through the abuse of power, to implement terror, although without massive assassinations or forced disappearances. I understand now that we are immersed everyday in experiences surrounded by passive acts of violence, and it is in this systematic construction of violence and kindness, subtle and devastating at the same time, where my brother and many others like him succumb.